Hope's Cafe: Fracture Photo Review and Giveaway! 10 Winners! Fracture-the new picture frame. I'm sure most of you have already heard of Fracture, but for those who haven't...or those who haven't been convinced of how neat they are, I'd like to share my Fracture experience. I'll start off by telling you that a Fracture is a photo and frame, all in one piece. Nor more getting a photo print and then having to find the perfect frame to hang. It is made from printed glass, and turns out a very beautiful photo! I received an 8x10 Fracture. It is sooo easy to design! First I had to decide which picture I wanted for this. May sound easy, but when you have as many pictures on your hard drive as I do...it's a little more difficult :) I finally chose a picture of my little brother (okay, he's taller than me now, but several years younger...so he's still my little brother!) with a friend. I appreciated the fact that the file size limit was so big...I have ordered from companies before that require a small file size, and I just can't seem to get a good quality while shrinking the file. After uploading, I chose what shape I wanted-landscape, square or portrait. Then it was time to choose a border-the fun part! 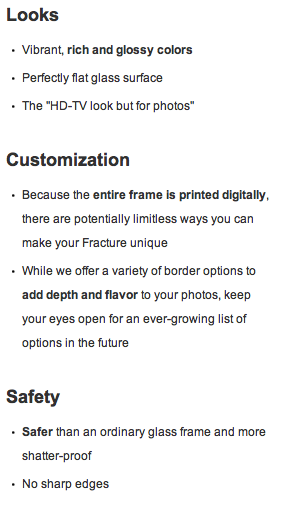 Fracture has a variety of patterns and solid colors to "frame" your picture. You can also choose no border, if you prefer. I picked a pattern border that matched my picture very nicely. After placing the order, I just had to be patient and wait! It seemed like forever, because I was very excited about seeing how my Fracture turned out, but was actually a very short time. It comes packaged very well, so there is almost no chance of the glass getting broken during shipment. It also includes all the necessary pieces for mounting! I haven't hung my Fracture, as I will be giving it to my brother. I have to say...I am sold on Fracture! The ease of getting my photo and frame all in one, coupled with the very reasonable prices, and fast, friendly service at Fracture just can't be beat! Fracture is looking for some new Facebook friends, so go over and "like" them...tell them you came from Hope's Cafe! Fracture is giving a 12" Fracture to 10 of my readers!! Go to Fracture and tell me something you learned! 1 entry-"Like" Fracture on Facebook and tell them you came from Hope's Cafe! This giveaway ends Friday, November 28, 2010 at 11:59 p.m. Please leave a valid email address in each comment, as this is how the winner will be notified. Winner will have 48 hours to respond, or another winner will be chosen. Disclaimer:I was not monetarily compensated in any way for this post. All thoughts and opinions are mine. All quotes taken from the Fracture Me website. It's shatterproof with no sharp edges. This is a very clever idea! The founders are Abhi Lokesh and Alex Theodore. I like "Money back life-time guarantee against fading or breaking (which never happen"! I like Fracture on FB! I entered your My Twinn Giveaway! I learned that it is safer than an ordinary glass frame and more shatter-proof. Would be great to have especially around children! I learned that Fracture was started in 2008! I entered your Langston's giveaway! I follow via GFC #1! I follow via GFC #2!